ASTM B23 #8 - OEM refurbishment LEAD Babbitt for low speed machinery, engines, and generators. 5Sn/80Pb/15Sb, nominal 1 lb. bars. ASTM B23 #8 - OEM refurbishment LEAD Babbitt for low speed machinery, engines, and generators. 5Sn/80Pb/15Sb, nominal 6 lb. notch bars. ASTM B23 #8 - OEM refurbishment LEAD Babbitt for low speed machinery, engines, and generators. 5Sn/80Pb/15Sb, nominal 35 lb. 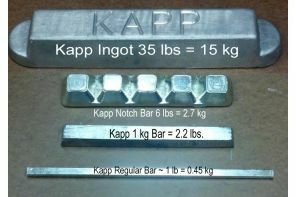 ingots. DuraKapp™#8 Babbitt is a general purpose, low speed, Lead-based Babbitt that displays good tensile and compression strengths under shock, load, pounding, and vibration. Our unique Precision Microcasting™ process, combined with high purity virgin raw materials, results in the world’s strongest, most ductile Lead-based Babbitt. DuraKapp™#8 Babbitt meets or exceeds the specifications for ASTM #8 Babbitt —also known as Royal, Grade 8, or QQ-T-390A No. 6 Babbitt. We back all of our products with a 100% satisfaction guarantee or your money back.